Based on the study of separate areas of Lake Baikal (depth from 14 to 250 m), influence of the grain size composition of bottom sediments on the distribution of methane and sulfide sulfur is examined. Concentrations of the components varied, respectively, from <0.01 to 1.81 µg/g d.s. (average 0.21 µg/g d.s.) and from 0.002 to 0.384 mg/g d.s. (average 0.027 mg/g d.s.). Comparison of the distribution of methane and sulfide sulfur concentrations testifies to active sulfate reduction at the same stations, where methane concentrations are highest, precisely in the northern area of the lake marked by the inflow of the Verkhnyaya Angara and Kichera rivers, as well as at some stations of the profile deployed along the estuarine zone of the Selenga River and stations located in the sublacustrine wastewater discharge zone of the town of Baikal’sk and the Baikal’sk Pulp and Paper Mill (BPPM), which was closed in 2013. Depending on the study area and sampling point depth, the share of the sand fraction (0.05–2.0 mm) in bottom sediments varies from 23 to 99% (average 57%); the silt fraction (0.05–0.005 mm), from 1 to 73% (average 39%), and the pelite fraction (<0.005 mm), from 0.0 to 8.7% (average 4%). Increase of the concentration of reduced gases in sediments correlates tightly with increase of the share of the fine-grained (silt and pelite) fractions. It is concluded that high or low concentrations of methane and sulfide sulfur at the studied upper intervals of sediments in Lake Baikal are caused not only by differences in the thickness of sediments subjected to the anthropogenic impact, but also by variations in depositional conditions that govern the grain size composition and, consequently, the content of organic matter and intensity of methane genesis and sulfate reduction. 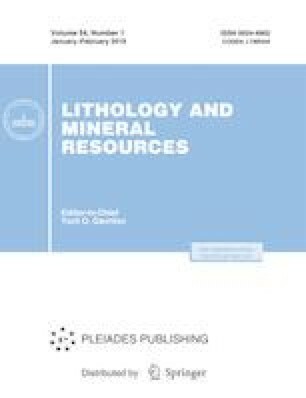 The authors thank S.A. Reznikov, PhD (Head of the Laboratory of Limnological Hydrochemistry, Hydrochemical Institute, Rostov-on-Don) for placing at our disposal analytical data on the Corg contents and grain size composition of bottom sediments. This work was supported by the Russian Ministry of Education and Science (project no. 5.5791.2017/VU) and the Southern Federal University (project no. VnGr-07/2017-24).